Set for July 30, the 2016 BEIJING SUMMER RAIL JAM is a full day of action packed activities surrounding a city jam session snowboarding event. A range of local heros and world class snowboarders will battle it out on the streets of Beijing. The iconic Sanlitun Soho at Beijing's posh downtown embassy area creates a grand backdrop for the event. Its "Sunken Plaza" at the basement level of the compound provides ample space for a large crowd and all ongoing activities. The largest off-season snowboard event in China is a backdrop for an eclectic riders line up that includes Eero Ettala (FIN), Jacco Bos (NLD), Eric Beauchemin (USA), Dominik Wagner (AUT), Ethan Morgan (DEU), Park Linam (KOR), Sean Ryan (USA), Felix Engström (SWE) and Japanese Stars Shoma Takao, Yuya Akada and Ryusei Takahashi. Major industry brands join the tight club of China's top industry leaders that are set to vow a crowd, with one goal in mind: to let more people enjoy and experience snowboarding close up. "We think it is a great opportunity to celebrate the one year anniversary of Beijing winning the bid for the Winter Olympics in 2022" says Lai Gang of GoSki. From 10:00 to 23:00, snowboard movie screenings, DJ's, live acts, a fashion market and games will keep the crowds busy. 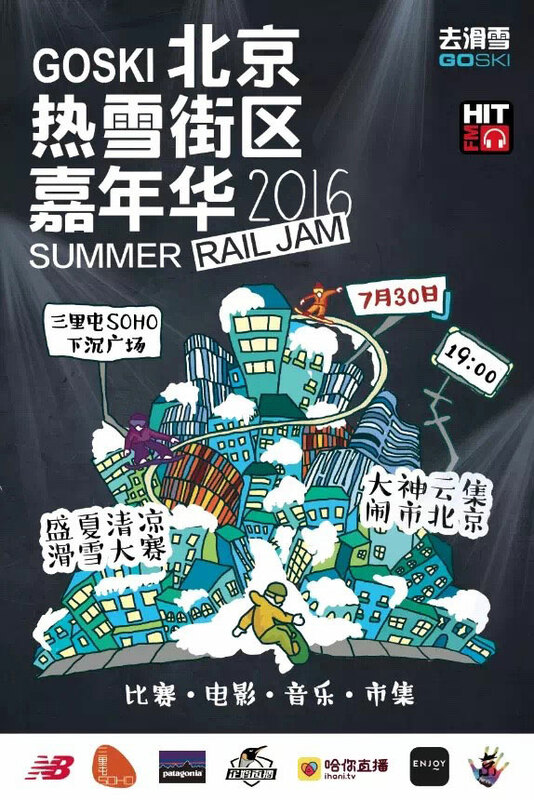 The finals of the 2016 BEIJING SUMMER RAIL JAM will be held from 19:00 – 21:00, with an award ceremony and live shows following. GoSki, Chinas first social and commercial App for all things snowsports and HitFM, Chinas most popular radio station are the main event partners. Join the fastest growing Chinese snowsports community and share your experiences on the snow at www.GoSki.cn.